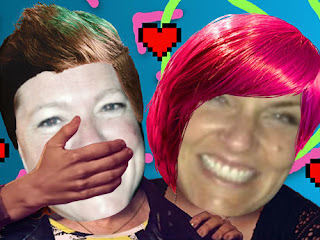 Click on picture to check out my newest JibJab video! There are simply some things in life that I will always love, not matter what. Take, for example, Jib Jabbing, or Elfing Yourself, as it use to be called back in the day. You can read about my obsession with Jib Jabbing in Feed a Cold and Jib Jab a Griever, but suffice it to say that putting people's faces to prefabricated music video characters is something that makes me tick. No matter how busy, tired, or jacked-up I feel, I always have time to put a smile on someone's face, literally, and send it out to make someone's day, as well as my own. I have spent hour upon hour doing this for fun. Last year, I neglected to send out card-stock holiday cards in lieu of Jib Jabbing my entire holiday list! After creating the first few music-themed holiday videos, I realized I needed to scrub up my card list, as it was super time-intensive to make an individual greeting for each recipient, but after whittling the list down to a manageable 75 peeps, I got to work laughing and enjoying. At the end of approximately 50 hours of jib-jabbing over a month-long holiday season, I came to the conclusion that one of the reasons I so love to Jib Jab is that is gives me the opportunity to really pay credence to the people I cast in the videos. Most times they are friends, family members, and occasionally mere acquaintances, but always they hold some sort of importance in my life. It's important to me to reflect on the connections I create and maintain and give them my undivided attention on a regular basis. It's also necessary for me to laugh at myself and those I know, right alongside them. Jib Jabbing allows me that freedom. I heard from at least half of the people I sent Jib Jab cards to last year, either via phone, text, email, or personal visit. Most LOVED the cards and in a few cases, some hated them to the point of asking me to use a more flattering picture of them next time. But in all cases, they appreciated the time and energy I put into their individual holiday dance. I so enjoyed the human connection! I have never received a personal response from a card stock holiday card in the past, other than an obligatory return card in the mail. You should give Jib Jab a try this year; it's worth the $12/year membership fee (you can try a few for free before they ask you to subscribe). And Jib Jab should be hiring me as their spokesperson!